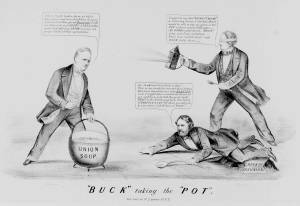 A pro-Buchanan satire, critical of the divisive or sectionalist appeal of the other two presidential contenders in the 1856 race. "Buck" or Buchanan (left) has evidently won a card game over Fremont (fallen at right) and Millard Fillmore (at right, blindfolded). Holding four aces and a large cauldron of "Union Soup" Buchanan vows, "I have fairly beaten them at their own game, and now that I have became possessed of this great "Reservoir" I will see that each and EVERY STATE of this great and glorious UNION receives its proper Share of this sacred food." Fremont has tripped over a "Rock of Disunion" and fallen to the ground, still holding his large spoon "Abolition." He laments, "Oh, that I had been born a dog!--This is too much for mortal man to bear. Had I not stumbled over that "Blasted" rock I might have reached the fount of my ambition and with this good ladle 'Deal' to the North, and leave the South to 'Shuffle & Cut' off their mortal coil, by starvation, I shall have to 'Pass'!" Behind Fremont, Fillmore wanders blindfolded, holding a Know Nothing lantern (reflecting his party's nativist affiliation) and a spoon. He despairs, "I regret to say that 'Going It Blind' is a loosing Game, I did hope that I would be able to dip my spoon in the Pot without much difficulty.--My Hand is played out--'Buck' wins, and I am satisfied--Four aces can't be beat! and Buck holds them."